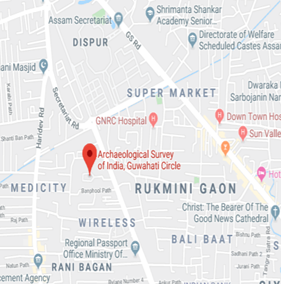 The Guwahati Circle of Archaeological Survey of India, with its head quarters at Guwahati was established in February, 1983 after bifurcating from the Calcutta Circle and it is playing a greater role in preservation, protection and maintenance of the ancient monuments and archaeological sites of the northeast region or the land of Seven sisters comprising the States of Assam, Arunachal, Manipur, Meghalaya, Mizoram, Nagaland and, Tripura. This geographical unit lying in the northeast corner of India is surrounded by the foreign lands viz. Myanmar, Tibet of China, Bhutan and Bangladesh. The strategic location of the region, diverse cultures, languages, religions, plethora of legends makes it a significant place in the cultural history of India. The beautiful flora and fauna, the undulated topography of the land forms viz. plateau, hills, mountains, river valleys, deep gorges and plains made it a replica of the Indian landmass.